Iyengar yoga is meant for all and is a way of life. That’s what I learned from Mr. Iyengar’s teachings. I was lucky to meet and practice under a very dedicated Iyengar yoga teacher in Bangalore, India. And when I came back to Vancouver I was lucky to find another. I didn’t know the first thing about yoga when I went to India and I was reluctant to try it. But a couple of friends convinced me, and after the first class, I never looked back. My teacher guided me through asanas, yoga poses, giving detailed instructions. Standing asanas…sitting, twisting…shoulder stands, head stands, hand stands. Things I’d never done before. Every two hour class was a challenge but I loved it. I left every class dripping with sweat – partly because of the heat, but mostly because my teacher was tough. I always felt like I had worked every part of my body. I appreciated the years of training that Iyengar teachers must go through to become certified. I appreciated the detailed instruction and the use of props – wooden blocks, bolsters, straps and ropes – to assure proper alignment. “He is a genius,” my first teacher said. Both of my teachers had a chance to travel to Ramamani Iyengar Memorial Yoga Institute (RIMYI) in Pune, India, to practice with Guruji himself. And one of the students that I practiced with was in Pune this month. She had the privilege of being with Mr. Iyengar in life and in death (read her Farewell, Mr. Iyengar blog). 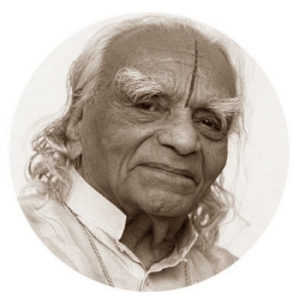 Mr. Iyengar passed away yesterday, but I am grateful that his wisdom and teachings will live on through his students.